Every year during the event of Ashoura, Bahrain clearly shows that it is the centre of religious freedom, not only to its own residents but to the citizens of the surrounding Gulf countries. The Minister of Justice Visit a Shia Centre. Thousands of people come from various Gulf States to Bahrain in order to participate in the Ashoura religious celebration. Huge demonstrations take place during this event, with the active participation and facilitation of the Bahraini Government, which donates both food and money to the Shia centres (maatams)1. According to the Shia Endowment statistics of 2009, nearly 1100 Shia maatams were officially registered in Bahrain. Other statistics claim that the number could be as high as 5000, including unregistered ones. Abdullah Saif states in his book (Al Maatam in Bahrain) that in 1994 there were more than 3500 maatams for men, excluding women’s maatams. During the Islamic month of Muharram, Bahrain’s image changes due to the increasing number of maatams, to the extent that some would refer to it as the Karbala of the Gulf. This is due to the fact that tens of thousands of Gulf citizens make a pilgrimage to it in order practice their religious rituals freely, unlike any other Gulf country. People will differ in assessing the political and economic situation in Bahrain, but everyone agrees that religious freedom is a historic characteristic of Bahrain. The Minister of Justice and Islamic Affairs, Sheikh Khalid bin Ali Al Khalifa stressed that religious freedoms have always been a priority and protecting and caring for religious freedoms is one of the main obligations of the State. The Minister also stressed that the commemoration of Ashura gets special attention in the form of continuous follow-ups and advice, in order to provide the necessary support and services. The Minister of Justice visited a number of maatams in Manama and attended the opening of the Imam Hussein Clinic where he said: “the annual commemoration of the martyrdom of Imam Hussein (may Allah be pleased with him) on the 10th of Muharram, is a time to remember and learn noble values. The values of faith, sacrifice, and great ethics are all embodied in Imam Hussein’s character, which merit preservation in honour of this great man, who the Prophet Mohammad (pbuh) described him by saying: “Hussein is from me and I am from Hussein. Allah loves those who love Hussein.” (Al Khaleej News 12.12.2010). The Minister also stressed that: “the unity of the Islamic nation is the main goal, which the noble Prophet, his progeny and companions sacrificed their lives for. Their blood was shed in order to strengthen the Ummah and preserve its pride and honour”. He also added: “We in Bahrain (thanks to Allah) were and still are the best example for co-existence, unity and harmony between citizens. The commemoration of Ashura during all these years among other occasions, promote unity and harmony in the country. He called for taking advantage of religious and national occasions, in order to promote national unity and values of forgiveness between the diverse Bahraini communities. 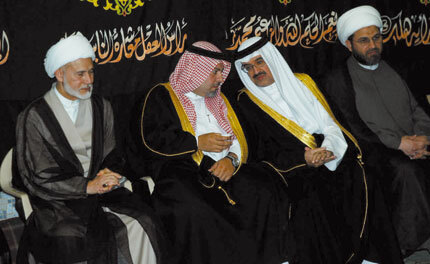 Ashura in December 2010 provided ample evidence that Bahrain is a diverse country unlike any other in the Gulf. It is a country that promotes freedom and religious tolerance. 1 Maatams mean the Shia Centres for the Commemoration of Imam Al-Hussain, the son of Ali Ibn Abi Taleb and who was killed and beheaded in the Battle of Karbala in 680. Al-Hussain is considered by all the Shia as a martyr who fought tyranny and the ruling of the Umayyad Caliphate established following the death of the final Rashidun (Wise) Caliph, Ali Ibn Abi Taleb. The mother of Imam Al-Hussain is Fatima al-Zahra, daughter of Prophet Mohamed. The anniversary of the death of Imam Al-Hussain is called ’Ashura (“tenth” day of Muharram) and is a day of mourning for the Shia Muslims.